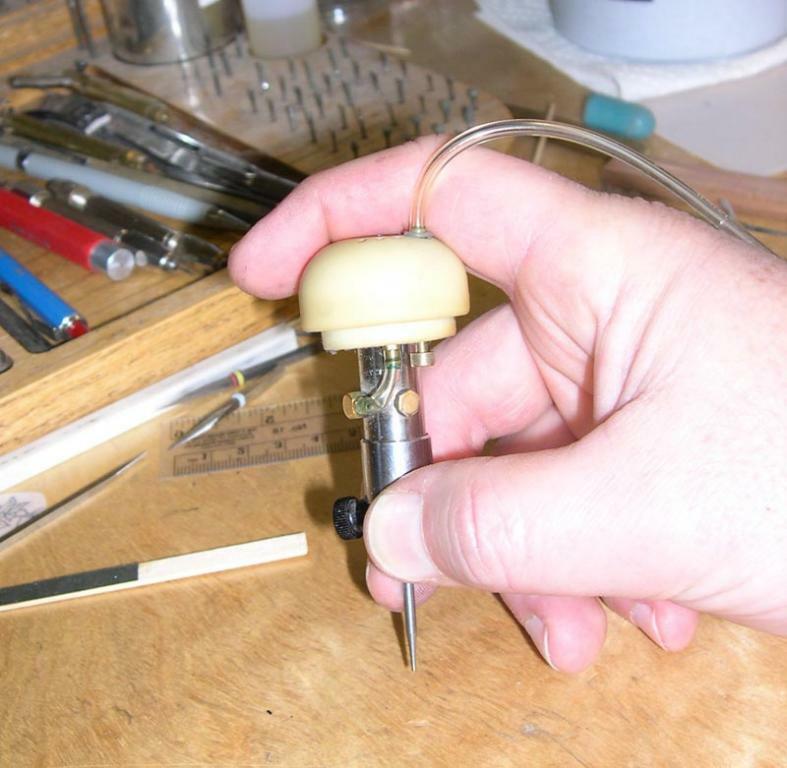 If you are an instructor at EngravingClasses.com or an AirGraver owner and you would like to write tutorials to be included on this page, please email today. The "On-Demand" tutorials will automatically take you through paypal for payment. After payment you will receive access to the tutorial you purchased for 30 days. You may print the tutorial and keep it for a personal reference. 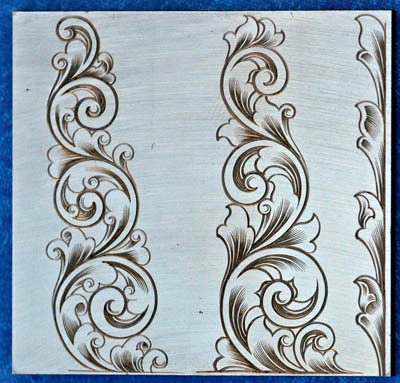 This tutorial takes you step by step through Ray's process for doing selective french gray on an engraved and blued object. 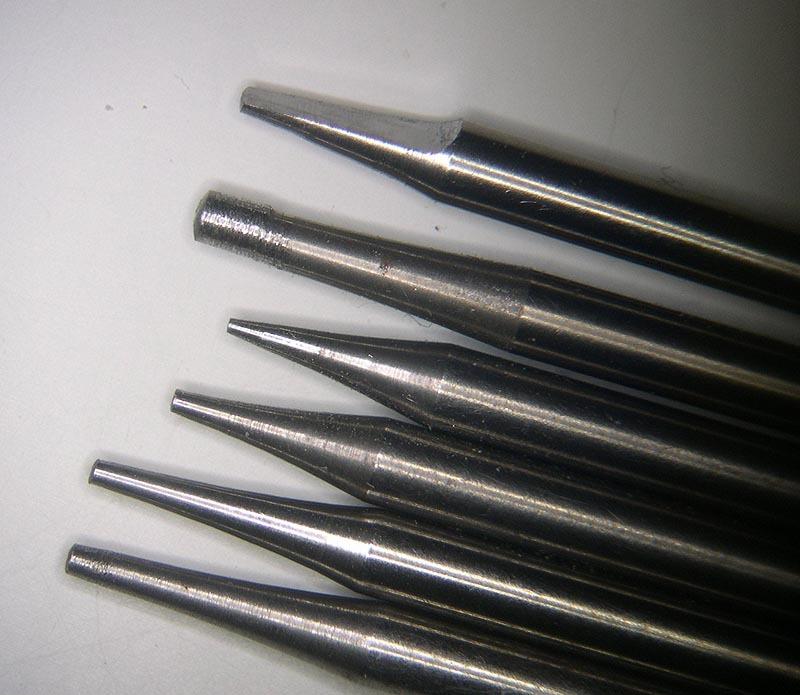 He discusses the tools and materials, where to get them, how to do the procedure, as well as alternative methods for doing the french grey manually without the pen plating set up. 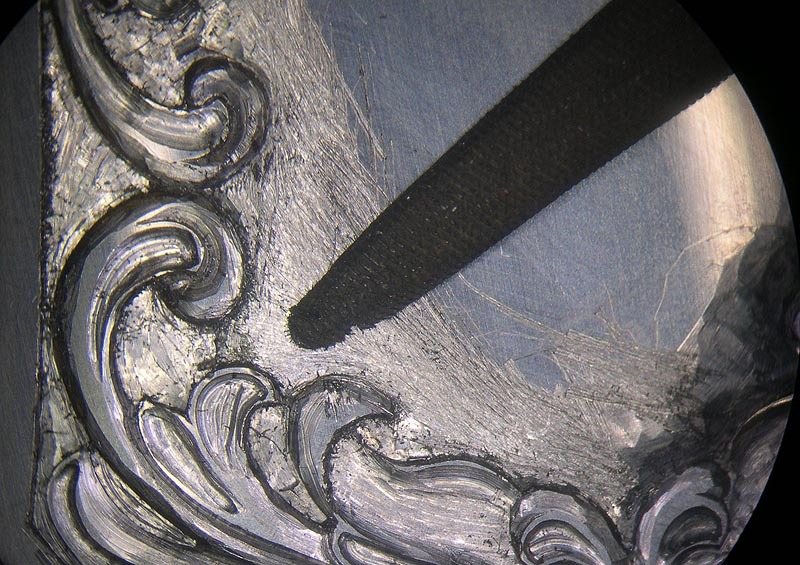 Dans ce tutoriel je vous montrerai le chemin à suivre pour créer pas à pas un projet de gravure sous forme de dessin comme il n'est pas possible de le faire avec un crayon et du papier. 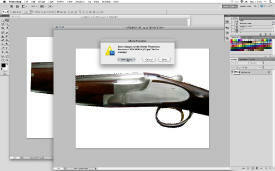 Vous apprendrez à maîtriser les outils essentiels pour utiliser Photoshop dans ce genre de travail. Ce tutoriel peut être appliqué sur tous travaux et projets. I ci, je vous montre un dessin sur un fusil mais c'est le même procédé pour un couteau, stylo,etc... J'ai appris à dessiner et graver avec les méthodes et techniques classiques (vieilles) comme vous l'apprenez toujours aujourd'hui à l'école. Je pense que les nouvelles technologies sont le chemin à prendre lorsque c'est pour réaliser un meilleur travail et seulement dans ce cas; et ici, c'est incomparable au niveau de la finesse et de la propreté du travail. Ce n'est pas parce que vous utilisez un ordinateur, binoculaire ou l'airgraver que ce n'est pas du travail fait main, c'est juste une autre voie pour créer ce que vous voulez avec une des meilleures qualités que vous savez obtenir sans machine. C'est la logique de l'évolution de la gravure main et c'est le progrès pour le meilleur... comme je l'aime. 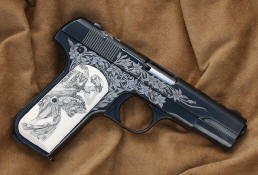 Note: Roland's tutorial above is included inside his book "Learning Gun Engraving". when engraving a knife. I cover every step from start to finish. etc, all the way through the process of this knife project. 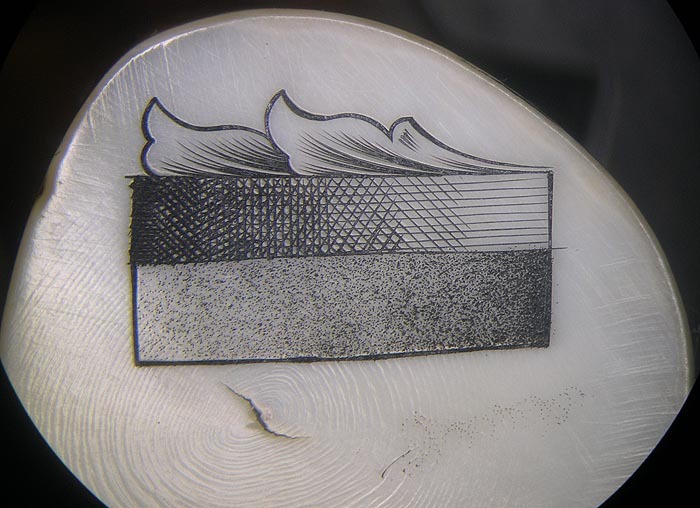 The tutorial ends with a photo of the finished knife and a jpeg of the transfer I used for the engraving (that can be printed out and used for practice if you wish). I also give photos and info on some of the specialty tools I use along the way. 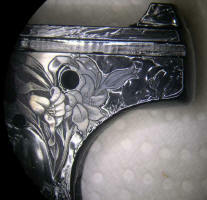 This tutorial is knife specific and deals directly with the process for engraving a custom handm ade knife. 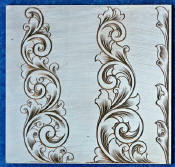 It is not a general engraving tutorial where I teach you how to sharpen a graver, make a cut, cut a scroll etc. 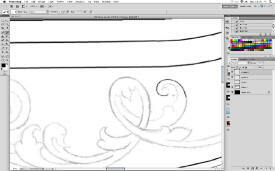 I have another tutorial here on shading. Those same principles of shading were used in this tutorial. I have tutorials on gold inlay, tool sharpening, etc. 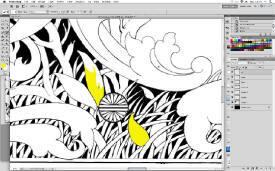 in the works that I hope to have available soon. While all those skills are shown here I do not follow those side topics in detail here. 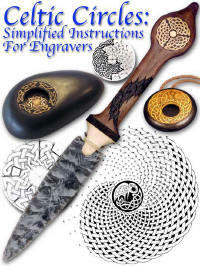 Here we are dealing with the process and procedures I use to engrave custom knives. 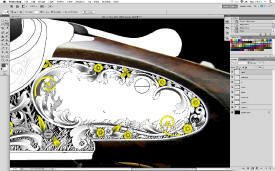 shows you how to use his shading method to shade both a Nimschke type and a McKenzie type scroll. Approx. 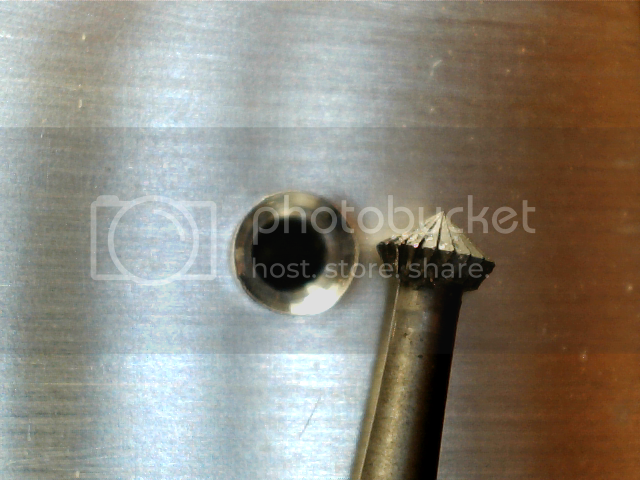 2800 words, 23 images. 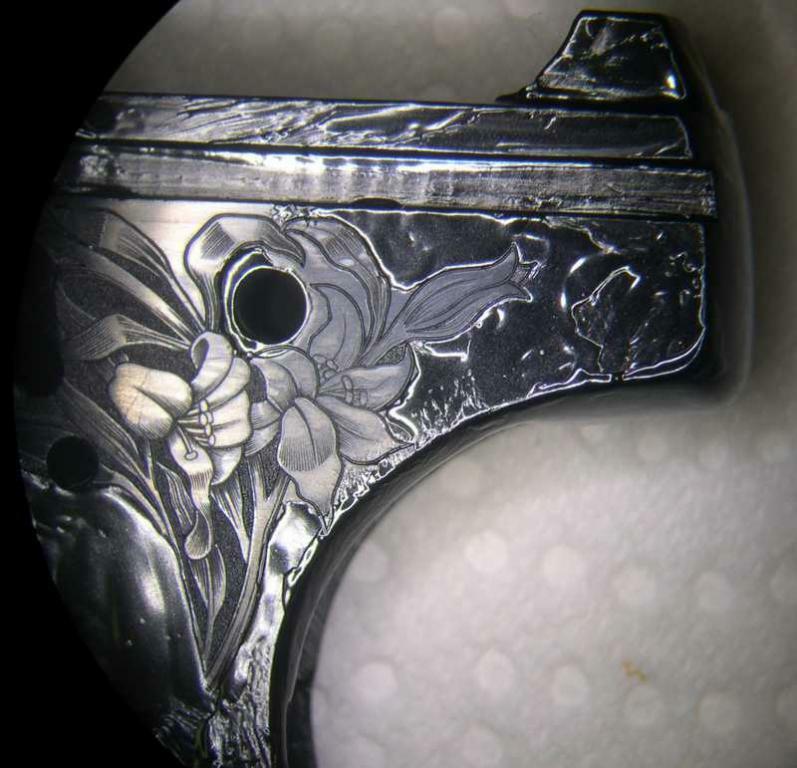 Ray Cover is an engraver of fine firearms who also has a following of people who collect his work in the high end knife, pen and fly rod markets. 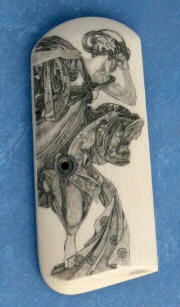 Ray teaches classes in his studio in Festus, Missouri. 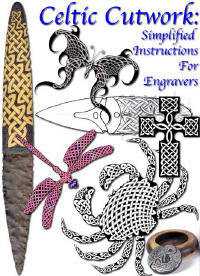 Celtic Line Drawing for Engravers, by Tom Sterling From its roots in the mysterious and unwritten distant past of Celtic art and ornament, Tom Sterling provides a series of tutorials on Celtic Line Drawing, concentrating on contemporary methods designed for engravers. 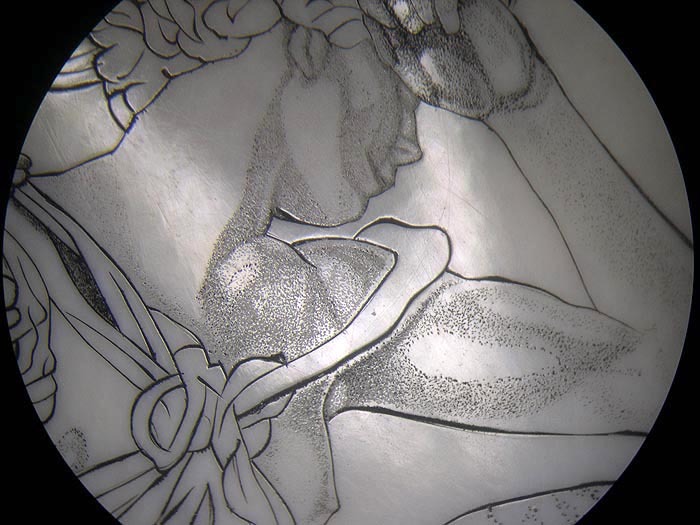 You don’t need to know how to draw or have well-developed artistic skills to be a complete success. 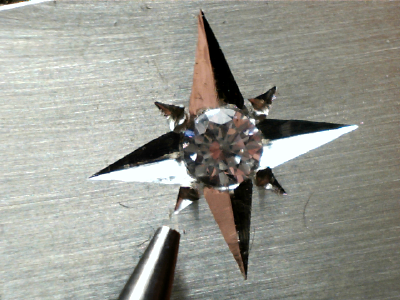 These methods are simple, yet provide spectacular results - YOU CAN DO THIS! 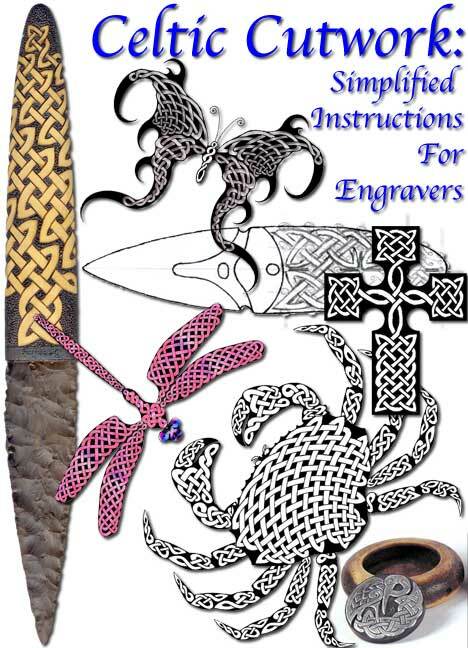 Needing nothing more than pencil, paper and a desire to learn, you can create complex Celtic designs in a very short time - hours, not days or weeks. 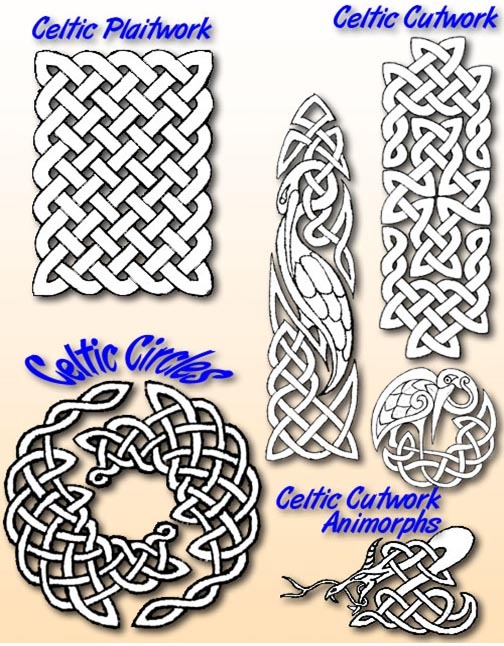 Part 1: Celtic Plaitwork is available for free, and is the basis for the following Part 2: Celtic Cutwork, and Part 3: Celtic Circles. 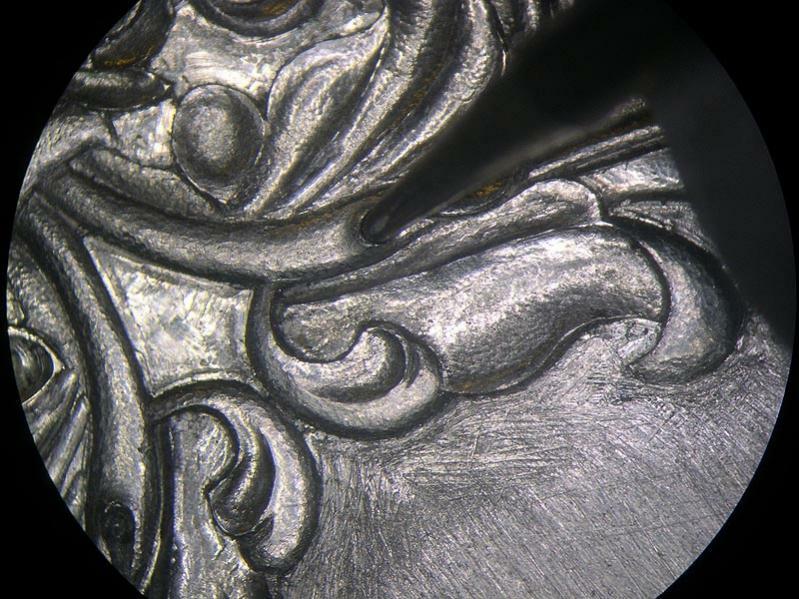 If you enjoy Part 1: Celtic Plaitwork, then you’re ready for the far more spectacular results in Part 2 and Part 3. 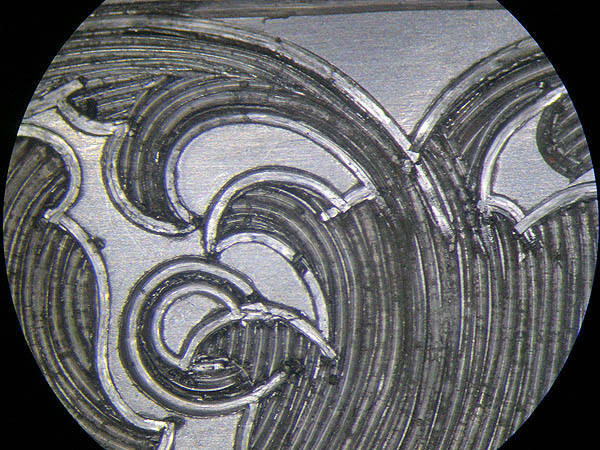 Part 2: Celtic Cutwork explores the heart of contemporary Celtic interlaced ribbons, extending the system of circles and lines. 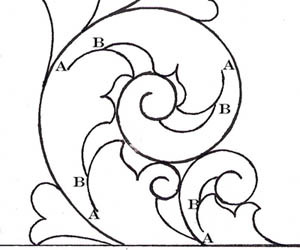 Cutwork is where Celtic Line Drawing comes alive. 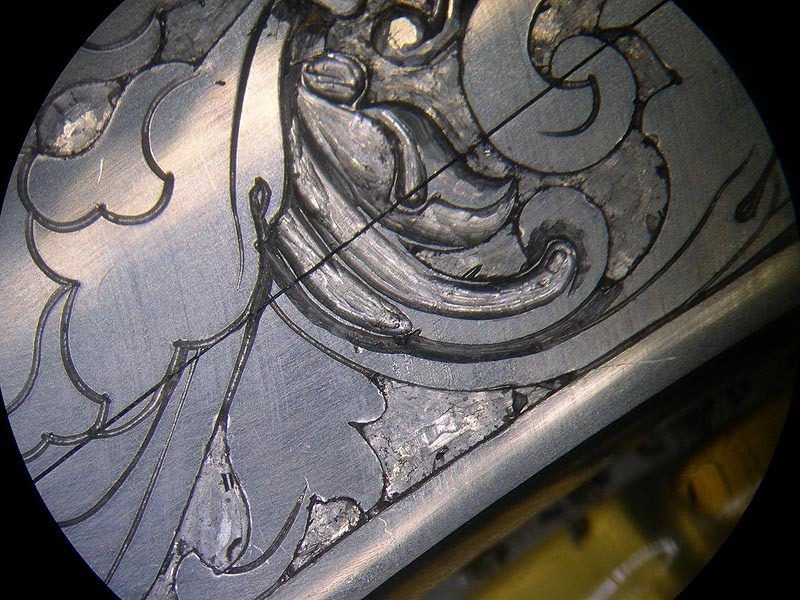 We’ll also develop Celtic patterns, fitting them on knife shapes for engraving, and discovering simple methods for using computer illustration programs like Photoshop for cleaning up, scaling and fitting our drawn and scanned images for transfer to metal. In addition, we’ll develop Celtic Animorphs (animal images) using these contemporary Celtic techniques. 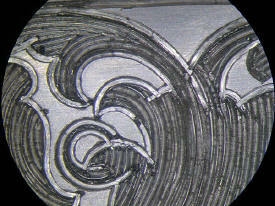 And, finally, we’ll examine how to develop Celtic borders and develop engraving strategies for optimum cutting. 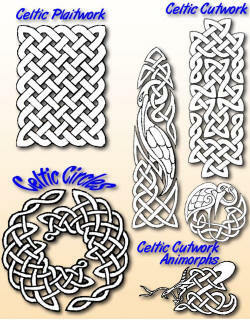 Part 3: Celtic Circles will extend even further our simple line drawing concepts. 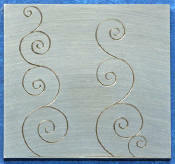 We’ll create circular Celtic designs and find out how to work our circular designs into ovals. 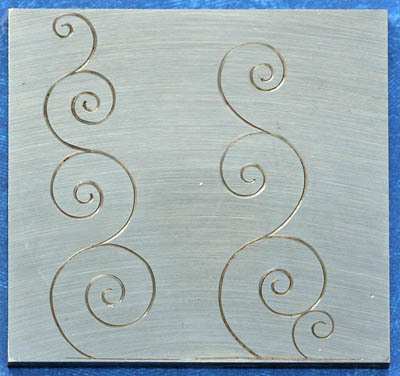 We’ll examine how to draw Celtic designs directly on complex 3-dimensional surfaces, ready for engraving. Approx. 9000 words (counting all three parts) approx. 100 images in parts 2 and 3 combined. Parts 2 and 3 or Celtic Line Drawing for Engravers - Price $10 Purchase by selecting the tutorial here After purchase you will be able to see the tutorial at this link. Note: Please do not copy the on-demand tutorials by electronic means for the purpose of sharing or you may loose access to future tutorials. 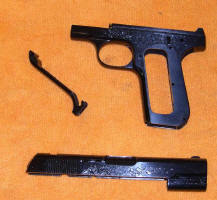 The instructors have made these tutorials for the person who purchases it only. Thank you.